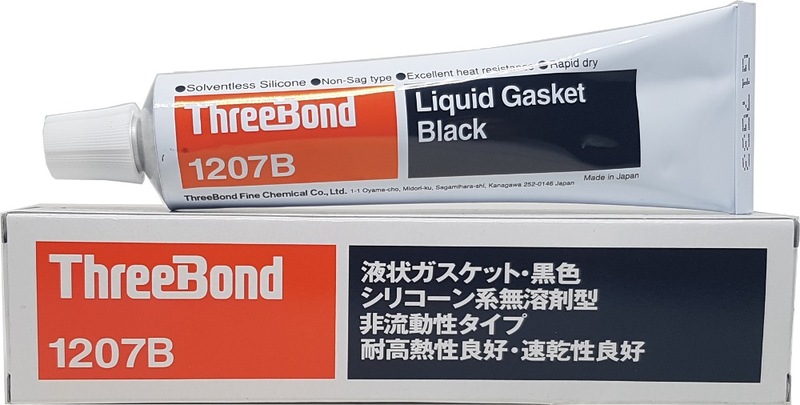 Three Bond 1207B is a black single-component, solvent free and non-acid liquid gasket based on RTV (Room Temperature Vulcanising) silicone with low odour emission. Within a very short time it forms a rubber-like highly elastic gasket completely adapted to the surface structure of the flange facing. 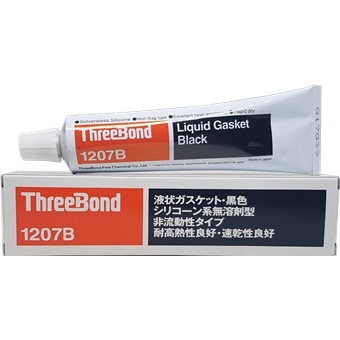 TB1207B has been designed specifically as liquid gasket for flange surfaces which must resist extreme vibrations, e.g. cylinder head cover, press steel oil pans, water pumps etc. TB 1207 B has excellent chemical resistance against coolants and engine oil & outstanding mechanical and thermal resistance. It has excellent adhesion even to slightly contaminated surfaces and is extremely fast curing. It offers instantaneous impermeability for pressure-and fire testing. You can accelerate the curing process by heat and contact with the medium. There is no shrinkage and no generation of corrosive gases. It is not corrosive to metal and there’s only very slight reaction on plastics. This product is recommended by many OEM manufacturers including Honda, Suzuki, Kawasaki, Triumph and BMW.